Is your leadership journey influenced by the likes of Jack Welch, Susan Cain or Jim Collins? How about George Alan O’Dowd, otherwise more commonly known as Boy George? This 80’s pop singer, songwriter, DJ, fashion designer and photographer is actually an unintended management inspiration. Don’t you hate it when you see an interesting headline only to read further to discover the article had very little to do with the heading! The bad news is that this is almost one of those articles; and the good news is that it’s only a short read so you might as well keep going. I have to admit that I have never met Boy George and never really appreciated his music. I much preferred rock bands growing up, probably a product of spending my high school at a boys only boarding school. I also tend to think Boy George was way ahead of his time in terms of his androgynous look. Despite never being a fan, whenever someone points to culture as a key priority for the business, I immediately think of Boy George and his band Culture Club. A few years ago I recognised a poor culture (led by yours truly) as a cause of many of our issues at work. Internal conflict, lack of accountability and poor teamwork were all examples of the dysfunction within our organisation. But I was too proud to admit the culture was bad and avoided joining the “culture club”, instead trying to band aid problems as they arose. However, after a sustained period of poor leadership, I humbly set about reading about culture, asking peers and mentors, attending workshops and finally engaging a consultant to show us how to transform our company culture, in a top down approach. I am pleased to say that two years on, there has been a significant improvement and our weekly engagement surveys continue to show improvement. So now I am culture club’s no. 1 fan. The third thing that Boy George has taught me is that his success as a solo artist in the late ’80s onwards was nowhere near the success he had in a group. For a few years I tried to adopt a flat management structure whereby I alone was managing over a dozen staff. I was basically an ineffective leader and manager, and it was only when I formed a leadership team and helped develop their leadership skills, that both the company and I improved. Never again will I try to be a solo artist! 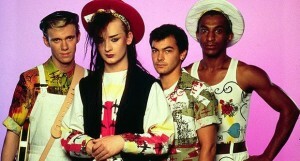 The final influence from Boy George was the fact that Culture Club saw the benefits of diversity. Realising that they had a cross-dressing Irish singer (Boy George), a black Briton, a Jewish drummer and an ethnic Englishman, they aptly named their band Culture Club referring to the ethnic backgrounds of the members. Banna Property Group has 8 different ethnic backgrounds across its 15 staff (however no cross-dressers that I am aware of) and this diversity is recognised and valued as our own Culture Club. Leadership inspiration comes in many forms, however I doubt you will ever find any references to Boy George in any management text books or in the Harvard Business Review (unless they want to publish this?). Perhaps it is time to widen our image of business influences?